IF LEVELS of fame worked like levels of terrorist alert, the White Stripes would be flashing safety orange, the Defcon Five of terror. The closed-mouth Detroit duo has everything it takes to balance in that sweet spot between superstardom and cult-figure status. The recent release of their latest album, Elephant, has been a test of their ability to stay in this sweet spot. Will they succumb to sellout style over substance, like Courtney Love, or will they maintain a level of distant cool, like the Strokes? Only time will tell, but Jack White made a smart move modeling the songs on Elephant on the blues; nothing is safer these days than skronky guitar underneath woe-is-me vocals performed by two cute white kids. Let's attempt to deconstruct some of the White Stripes' selling points. Perhaps you can decide: true brilliance or manufactured cult? 1) They are adorable. Both of them. The girl is the drummer. The boy sings and sometimes screams. He has the ability to scream in both the blues style and the AC/DC style. 2) The boy and the girl have the same last name and are not married, and no one seems to know for sure whether or not they're brother and sister, a divorced couple, the result of a coincidence in nomenclature or perhaps clones. This is a brilliant PR move. 3) Their second album, Di Stijl, was titled after a semiobscure Dutch modernist art movement. They style themselves to match this art movement, dressing only in red and white (although Jack has reportedly adopted one black pant leg--the rebellion!--at recent shows). 4) They sing an innocent-sounding song about childhood friendship, "Fell in Love With a Girl." The lyrics to this song are erotically charged. The song gets played on mainstream radio stations, while still being called "an unlikely hit." 5) Their lyrics make just enough sense, but not too much sense. 6) They choose truly obscure songs to cover, such as Screaming Lord Sutch's "Jack the Ripper," alongside songs that might have been deemed uncool, such as Dolly Parton's "Jolene." 7) Somehow, with each successive album (excluding perhaps the segue from White Stripes to Di Stijl), they manage to sound rawer and rawer, thus bucking the recording industry's rule of suffocation by overproduction. 8) Elephant debuted at No. 6 on the U.S. Billboard charts, with Linkin Park's Meteora at No. 1, while the Stripes' album debuted at No. 1 on the U.K. charts, thus illustrating perfectly the difference between those two countries. 9) The songs Jack White writes himself are the embodiment of "ditty." 10) They are adorable. Both of them. All of this adds up to a pleasingly catchy, sometimes downright rockin', often arty, beautiful smirk. Is it a celestial quirk of fate that Target and the White Stripes have the same color scheme? Is it really realistic to think that a secretive marital/sibling relationship could be maintained in this era of easy birth-record requests without some sort of press conspiracy? And why the hell are the White Stripes playing private parties for every movie star this side of Jack Nicholson, anyway? John Lennon would never have done that, unless there was lots of pot involved. Maybe there's lots of pot involved. It's not by accident that the John Lennon comparison comes up. Jack White has the kind of voice that recalls various famous singers at various moments. He channels everybody he's ever listened to, including Lennon. As Elephant makes its peanut-seat rounds, the true test of the White Stripes may be whether or not those who listen to them just to enjoy the music can ignore the irritating static of the hype machine. 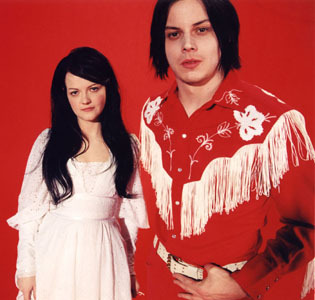 If they can, then the White Stripes may find themselves in that rare company of cult groups to win a Grammy. The White Stripes play April 28-29 at the Warfield Theatre, 982 Market St., San Francisco. Both shows are sold out.